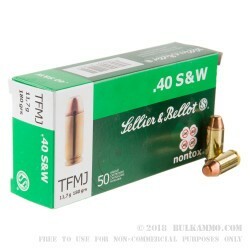 This 40 S&W cartridge by Sellier & Bellot sports a 180 grain projectile, which is a bit on the heavier side for what its caliber is typically commercially available with. 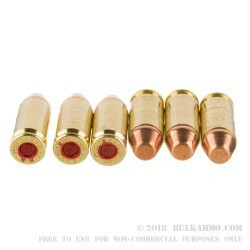 This round is billed as “nontox” in part because of its bullet’s total full metal jacket -- by enveloping the bullet’s base, the jacket prevents hot propellant gasses from evaporating the core while it is fired. That this round and its primer are also free of barium, mercury, and antimony, making this a clean-fire option at the range. 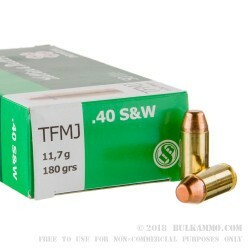 This round’s has a subsonic muzzle velocity of 940 fps, and its Boxer primed factory fresh brass casing is the perfect stuff for handloading. Based in the Czech Republic, Sellier & Bellot has been around so long that they were founded by a royalist who saved his neck by fleeing the French revolution. 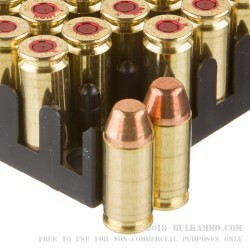 They’ve learned their chops during their considerable amount of time in business, so you can count on quality and performance while you fire their cartridges at the range.